We’ve heard a little bit about Facebook and Asana co-founder Dustin Moskovitz’s new foundation, Good Ventures, specifically a company that its investment arm got involved with last August. 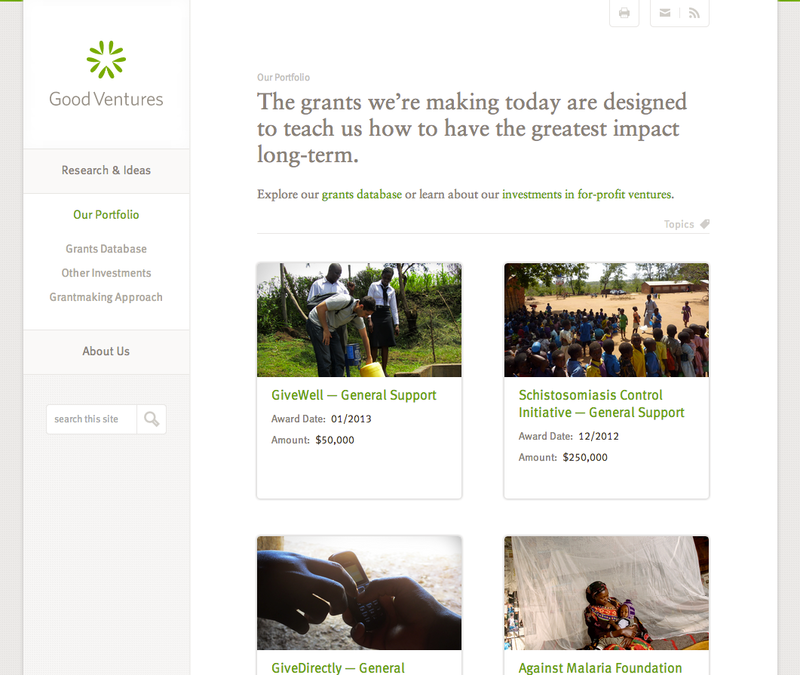 Today we’ve learned a lot more, specifically about its non-profit endeavours, as the site for Good Ventures has been launched, and it discusses exactly what the foundation will be doing and which companies and causes it’s currently involved in. Its “portfolio” reads like a list of every difficult problem felt in third-world countries, and it’s expansive already. Just some of the issues that Good Ventures has issued grants for are curing and treating malaria, marriage equality, and small enterprise support. The grants seem to average $50,000 and are going directly to the causes that need it the most. We’ve seen human well-being increase dramatically in recent decades. Quality of life is rising and violence is declining. At the same time, humanity is becoming better networked, technologically, economically and socially. We’re optimistic that these trends will continue — even accelerate — in the decades to come. Our giving, leveraged well, can quicken the pace of humanity’s progress and mitigate the risks that threaten to derail it. Our giving can increase the human capital on which society has to draw. Our giving can prevent unnecessary suffering by ensuring that the fruits of our collective labor benefit those who are most marginalized today. While there doesn’t look like there’s a systematic approach to its grants, it does seem like the organization gives Moskovitz and Tuna the platform to drive change by placing money directly with causes. For example, Good Ventures set out to co-fund Population Services International with the Bill and Melinda Gates Foundation last August. The cause supports an effort to contain and eliminate drug resistance to antimalarial medications, and Good Ventures donated $1M. People give to charity for a wide variety reasons. Some give to improve the lives of their friends, family or neighbors. Some give to advance a cause or support an organization that’s close to their heart. Some give to express their faith or spirituality. Some give because it feels good. The primary goal of our giving is to improve the lives of as many people as possible as much as possible. We believe that all lives are valuable, including future lives. These guiding principles have big implications for the foundation’s approach to grantmaking. We’ve reached out to Moskovitz and Tuna and will hopefully be telling a bit more of their story in a future “Weekly Good” article. Until then, head over to their site to see exactly what they’re up to.